Equipped with all-new Poulan Pro 174cc power series high-performance engine with auto-choke, the PR174Y22RHP lawn mower is designed and engineered for easy, no-prime starting, excellent balance, and low vibration. Heavy-duty engine components and steel construction provide exceptional durability and long life. With a durable, multi-function, 22-inch steel cutting deck, it's capable of side discharging, mulching, and rear bagging - with no tools required to change modes. It also features front-wheel-drive (fwd) with power assist transmission and high 11-inch rear wheels for excellent control and maneuverability on flat, hilly, and uneven terrain. It's simple to tip and turn the mower without disengaging the drive wheels at the end of a mowing row. Equipped with all-new Poulan Pro 174cc power series high-performance gas engine with auto-choke, the PR174N21RH3 push lawn mower is designed and engineered for easy, no-prime starting, excellent balance, and low vibration. With a durable, multi-function, 21-inch steel cutting deck, it's capable of side discharging, mulching, and rear bagging - with no tools required to change modes. High 11-inch rear wheels provide excellent control and manoeuvreability on flat, hilly, and uneven terrain. Plus, heavy-duty engine components and steel construction provide exceptional durability and long life. 160cc 3-in-1 Front Wheel Drive Gas Lawn Mower 21 inch, L2821 The Jonsered L2821 21-inch self-propelled front wheel drive lawn mower delivers superior mulching, bagging, and discharge performance. Powered by a 160cc Honda GCV160 engine, with 6.9 ft.-lbs. gross torque. Featuring dual trigger, variable speed controls; quick height adjustment; and high rear wheels, the Jonsered L2821 provides power, maneuverability, and ease of use to get the job done. 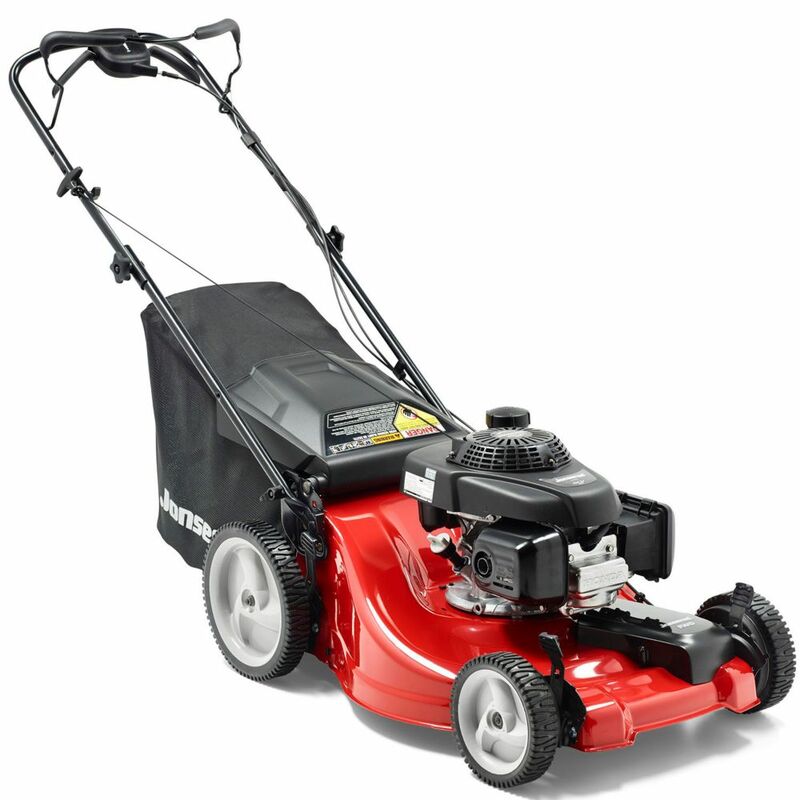 160cc 3-in-1 Front Wheel Drive Gas Lawn Mower 21 inch, L2821 is rated 3.4 out of 5 by 10. Rated 2 out of 5 by Disappointed from self-propelled failure I bought this mower 4 months ago and the self propel system keeps getting clogged with grass I have removed the cover for the drive and this has fixed the problem. I mow at least once a week so it is not that my grass is to tall as I have not had this issue with my previous mowers. The dual handle drive levers are uncomfortable to hold. The only good feature with this mower is the Honda engine. Rated 5 out of 5 by Jerry14 from Nice mower I am 58 years old and this is my first self propelled mower. I’ve had it for one year now...about 40 mowings. Love the design and ability to set my own pace. Mulches well, and when I do bag it empties easily. The automatic choke allows it to start on the first pull. Also has a shut off valve which most mowers do not have. Has the Honda engine which is a plus. Rated 5 out of 5 by Rocky from Excellent mower. Very well made, starts great and love the all-wheel drive. Excellent mower. Very well made, starts great and love the all-wheel drive. Rated 1 out of 5 by Agathon from I really wanted to like this mower. I was excited about the handle design for the self-propel, a... I really wanted to like this mower. I was excited about the handle design for the self-propel, and the bigger engine (173cc). Unfortunately, I am sorry to say, this mower was a huge disappointment for me. Hopefully others will have better luck with it, but I found it to be WAY too heavy–it was extremely difficult to maneuver, especially doing a simple turn at the end of every row I cut. It left me feeling dead for two days after–I felt like I had been run over by a truck. Also, every time I turned the mower around at the end of a row I had cut, it made this loud vibrating noise. I don’t know, of course, whether it should have done this or not, or if other mowers of the same model do it, but it certainly didn’t sound right. I had heard that bigger back wheels on a mower were supposed to be better for slopes and rough terrain, and I was eager to try them for the first time. These back wheels were HUGE, like pie pans. My experience is that bigger back wheels are terrible! I will never buy another mower with bigger back wheels again. They made the mower so much more difficult to turn and maneuver. Let me tell you: it gets extremely old very quickly when at the end of every row you cut you have this very difficult time simply turning a heavy mower with huge wheels 180 degrees. And at the same time you have a loud vibrating noise and you wonder if something is about to break... Also, the tire tread on these wheels was not good. Between the poor tire tread and the excessive weight of the mower, this thing was sliding hard down my slopes when I was trying to mow across them, and believe me, that was no fun. Mowing these slopes was the main reason I purchased an AWD mower. I cut half the yard that first evening, and put the mower away until the next day to finish. I filled the gas and got started. When the tank ran dry, I filled it up again, and pulled the cord to start the mower and finish my yard. And that’s when the worst part happened: the pull-cord just kept limply coming out, slowly and silently, in my hand. There was no way to start the engine! The engine had been used only a couple of hours, and now it was defective and unable to even be started. This was a huge disappointment. This was my first experience with a Kohler engine, and I must say: I will NEVER, ever buy another Kohler engine again. Besides failing completely in less than a few hours, the Kohler engine seems too “plasticky” and cheaply-made, especially across the top. I will stick to Honda mower engines, or Briggs and Strattons. I will say that the “two trigger” handle design for the self-propel is the best and most comfortable design out there. That’s the best thing I can say about this mower. I am currently on a “sister model,” a Husqvarna L221A, which seems better in almost every way, but which unfortunately may have a design defect as well with the self-propel and the grass gathering under the deck, although it’s too early to tell for certain. If you’d like an all-wheel-drive mower--and who wouldn’t? They’re the best!–I’d recommend the Husqvarna L221A or the Toro AWD 20353, if that awful Toro Personal Pace handle design doesn’t kill your thumbs and wrists like it did to me. If any mower maker ever makes an AWD mower with a good comfortable handle design and a good engine, and free of other defects, at a reasonable price, they will OWN this market! Believe me, I’ve tried a lot of pricy AWD mowers, and it’s been impossible to find even one that’s been free of defects. Rated 1 out of 5 by jnuttall from won't start Second use... won't start. Piece of junk. Wasted money.